The 2019 Rockport Gospel Music Festival was a Huge Success! Welcome!! Our festival began back in 1994 as a gospel music concert, sponsored by “Rockport’s Gospel Force” police quartet. The Gospel Music Festival has continued to grow throughout the years because of your continued support and through your attendance, your prayers and your contributions. Without your consistent support the festival would not be able to continue in the future. We are extremely excited and blessed to be able to have the 23rd Annual festival this year. As you know Hurricane Harvey struck Rockport in August of 2017 and because of the devastation we had to cancel the festival for 2018. We are so excited and blessed to have our very dear and special friends back with us again this year for the festival. Crimson River Quartet from California, who just celebrated their 26th year will be here celebrating their 20th year with us!! The Goldens from Tyler, Texas are dear friends and have been coming for 19 years!! The McNeills from Bonham, Texas are a dear family who we have grown to love!! This will be their 4th year with us!! They were blessed and privileged to be able to sing on the main stage this year at the National Quartet Convention in Pigeon Forge, TN!! Paul’s Journey from Houston, Texas is back with us this year as well as Megan and Logan Pettis. Larry DeLawder (also known as Barney Fife) from Branson, Missouri is with us and you will love his humor as well as the incredible talent of his whole family!!. Of course, we want to welcome our master of ceremony back – Brian Arnold of Branson, Missouri. The Rockport’s Gospel Force will also be here and pray that you have a worship experience that you’ll not soon forget! 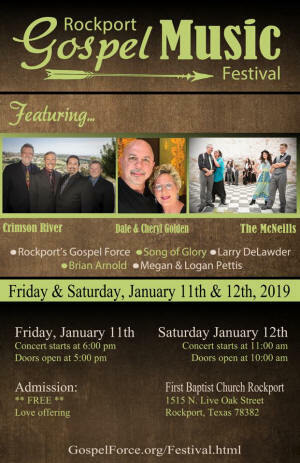 Please pray for the continued success of this festival and make plans to be with us for the next Rockport Gospel Music Festival in January, 2020 for our 24th Annual Rockport Gospel Music Festival. Mark your calendars for Friday, January 10, 2020 through Sunday, January 12, 2020! 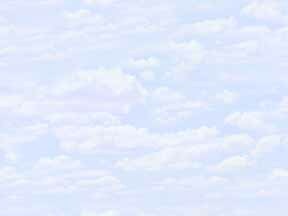 by Clicking on the Images Below! 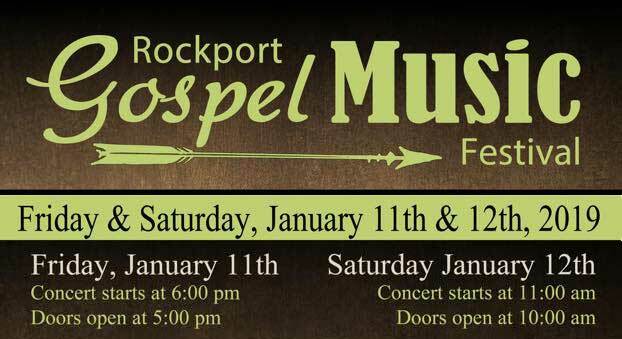 For more information on the Rockport Gospel Music Festival, or the Gospel Force Quartet, please contact Gary Howard at R.G.M.F. @ P. O. Box 2643, Rockport, Texas, 78381, or call 361.205.2789. Email address is grhoward76@gmail.com.